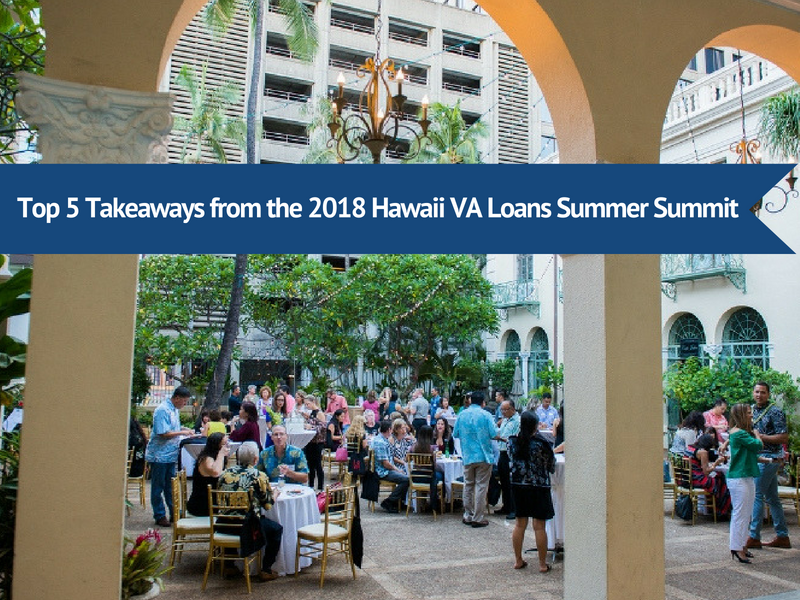 On August 15, 2018 at 3:30pm, the Hawaii VA Loans Summer Summit commenced at Cafe Julia in Honolulu. It was during the panel discussion portion of the event with VA Staff Appraiser Joseph Lorinc that attendees were able to gain valuable insights into the VA home loan program. Lorinc’s expertise produced five distinct takeaways on the topics of 1) appraisal clauses, 2) non-permitted additions, 3) reconsideration of value, 4) site condos/CPRs and 5) remaining entitlement. Continue reading to find out what he had to say about these popular VA loan issues. We’ve noticed that a common practice for VA offers is to include an “appraisal clause.” This is a statement that the buyer is willing to pay up to a specified dollar amount (i.e. $10,000) as a down payment to make up the difference between the appraisal and purchase price if the appraisal were to come in below value. This is a good way to show a seller that the buyer is enthusiastic about buying the property and willing to do so even if there is a discrepancy between the purchase price and appraised value. The VA does allow for this type of statement in the purchase contract. The VA doesn’t want to make it harder for veterans to get their offer accepted. All VA purchase transactions must include the VA addendum to the contract which contains the VA Escape Clause. That clause defines the veteran’s right to terminate the contract if the appraised value comes in below the purchase price. In conclusion, the appraisal clause may be included in a purchase contract. It can be used to convey buyer’s intent, despite the fact that it is legally unenforceable. Until about a year ago (July 10, 2017 to be exact), the VA loan program in Hawaii had very strict rules limiting the ability of a veteran to use a VA loan to purchase a home with non-permitted improvements. However, all has changed since then and the VA loan program has become much more flexible and easy to use for properties with this potential issue. The VA was aware of the additional difficulty place on our Hawaii buyers and through meetings with the Central Office, National Practice Group, and other Regional Loan Centers, they came up with a standard that could be used throughout the country. Note that it doesn’t specifically say that non-permitted additional won’t be valued. The determination of the value will be made by the appraiser based on the type, use, and marketability of the improvement. When an appraisal is scheduled to come in below the purchase price (on a purchase transaction), the appraiser will issue a “Tidewater” letter. That letter can’t convey anything about the substance of the appraisal, but is a “last chance” to provide information to the appraiser that could support the value at the purchase price. However, if that attempt to support the value fails, there is actually one more chance to address the appraised value. It’s the “reconsideration of value” process. That determination is done by the local VA staff appraiser. The staff appraiser is not bound by USPAP rules, thus he or she has some flexibility to make adjustments to the value that make sense, but that could not be done by the actual appraiser of the property. For example, in a rising market, appraisals will always be trailing the market somewhat, so an increase in value of 1%-1.5% or so could make sense. That may not be the case in a declining market. Bottom line, in a market like the current one, there may be room for $5K of additional value on a $700K purchase. Of course, that doesn’t mean that a rising market can give you an extra $50K on a $300K purchase! The VA loan program seems to be the last program to address the practical reality that detached condos often function and find market value in the same manner as single family homes (as opposed to their attached condo counterparts). That said, VA still requires that all detached condos be approved by the VA department before a VA loan can be obtained for the property. Good News! The VA does have a pilot program underway that treats detached CPRs (aka Site Condos) like single family homes. It likely won’t be coming to Hawaii any time in the near future, but let’s keep our fingers crossed it’s sometime in the mid-future! There were a number of questions posed by the audience asking about a veteran being able to have multiple VA loans outstanding (if the total loan amounts are equal or lesser than the county loan limit). The panel clarified that a veteran can have multiple loans outstanding AND if a subsequent loan does not have enough entitlement available to cover the full guarantee required, the veteran can come up with a down payment to make up the difference. That calculation is a little tricky. Call your favorite Hawaii VA Loans’ VA Loan Specialist to work out the details of your buyer’s specific situation!